Real PC Spy software is a computer monitoring software. It lets you know exactly what people do on your computer. It secretly records all PC and Internet activity, including typed keystrokes (keylogger), chats & IMs, emails, websites visited, Facebook use, microphone, games, online shopping and searches, video talk, videos watched documents opened, clipboard text, user names, passwords and more. The PC spy software also takes screenshots to show every details, like social media app use and all Windows store app use. Real PC Spy software starts automatically with your Windows starts and runs in a complete stealth mode and no one knows it is there except you. You can receive log reports via email or ftp like every 30 minutes. These reports includes text data as well as images of screen snapshots. Its graphic user interface is very easy to understand. 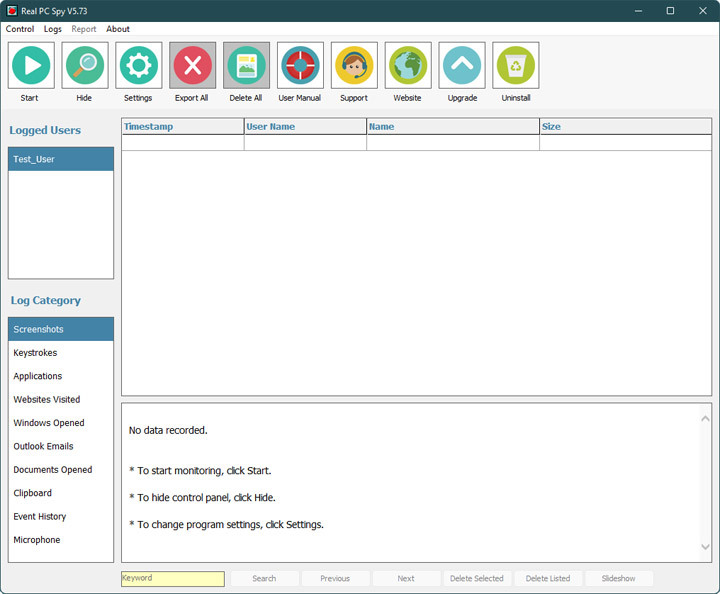 You can install and setup the program and start monitoring within several minutes. Real PC Spy software is a must-have tool for monitoring your employee or child, parental spying, protecting your kids from online predators, or catching a cheating spouse.